Raby Stud near Warren in New South Wales has achieved an injury rate close to zero thanks to a new approach. At Raby Stud, one of Hassad Australia’s 14 aggregations across Australia, the attitude that ‘it won’t happen to me’ is simply not good enough to ensure everyone gets home safely to their families every night. 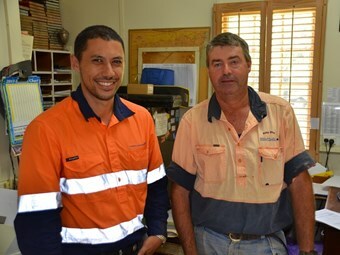 Key to this cultural shift has been a blame-free workplace where staff feel more than comfortable to talk about safety, regular ‘tool box’ meetings’ between staff and management, systems to ensure regular checking of workplaces and machinery, safety signage, and inductions for new staff and contractors. Stud Manager Ashley Bell has provided strong leadership to drive a shift in safety culture across all its operations. "At Raby Stud we have a set of policies to work by to keep the place safe. In many cases, our changes haven’t been time consuming or costly, and could be implemented in any farming operation," Bell says. "It’s not that hard to change the way you think about safety. You just get in a routine of checking everything before you use it, and we make sure that when staff come forward to say something is wrong, we fix it so no one gets hurt, and so the place can keep running." Infrastructure – maintaining buildings, structures and the workplace to safe standards. Culture – ensuring staff or family have the same attitude that safety matters and feel comfortable talking about safety in the workplace. Systems – making sure staff and family members can do their jobs safely. Includes checking equipment and workplaces, the ability to report and fix unsafe equipment, and having adequate training where needed. Raby Stud has swapped four-wheel motorbikes for side by sides, buried power lines and installed handrails in shearing sheds. The shearing plant and bunding on irrigation has been upgraded, ladders on silos have been covered and signage installed around the property amongst many other changes. Corporate owned properties are often viewed as having more funds available to invest in safety, however it costs very little for a family farm business to instil a positive culture of safety and prevent easily avoidable injuries. Hassad is also learning from other industries, with its assistant health safety and environment manager Shea O’Neill joining the company from the oil and gas sector, where an emphasis on safety is simply accepted as a part of how business is done. "The culture of safety in the workplace at Raby Stud and all Hassad Australia’s aggregations is driven from senior management all the way down to the most junior farm hand," O’Neill says. "We have systems in place and the staff are empowered to carry these out on the ground. "This means things like maintaining vehicles and equipment safely, using safety equipment like helmets on motor bikes, providing proper training for staff and regular audits of safety across the business to keep standards up. "Our systems have had a profound impact on safety of our workforce, with a decline in serious injuries and the overall incident tally. "I think that health and safety management as a whole in corporate agriculture is very strong at the moment," O’Neill adds. "Where we really need to focus our energies is getting out those key learnings on how corporates manage health and safety out to some of those smaller farming businesses. Those solutions could be beneficial for them." According to research conducted by the Primary Industries Health & Safety Partnership (PIHSP), almost 50,000 weeks of work in agriculture and fisheries were lost annually between 2008 and 2012 due to injury. The PIHSP aims to drive best practice in work place health and safety in primary industries. It is funded by the Research and Development Corporations (RDCs) for the meat processing, cotton, grains, fishing and livestock industries, as well as the Rural Industries Research and Development Corporation (RIRDC).